From Wikipedia: Genealogy, also known as family history, is the study of families and the tracing of their lineages and history. Genealogists use oral interviews, historical records, genetic analysis, and other records to obtain information about a family and to demonstrate kinship and pedigrees of its members. The results are often displayed in charts or written as narratives. The pursuit of family history and origins tends to be shaped by several motives, including the desire to carve out a place for one’s family in the larger historical picture, a sense of responsibility to preserve the past for future generations, and a sense of self-satisfaction in accurate storytelling. This week another chapter of our family story closed with the passing of David Alfonso Montoya who died in Salt Lake City on the night of March 5th. David was my uncle and my God Father. Dave, as he was known, was born 14 Jul 1927 to Jose Celestino Montoya (1905-1988) and Manuelita De Los Reyes Lujan (1904-1931) in San Francisco, Rio Arriba County, New Mexico. He was christened at the San Juan de los Caballeros Church near his home. Dave had an older brother named Jose who was born in 1926 and who died in September of 1927. He also had a younger brother named Peter Augustine who was born October of 1929 and who died in August of 1997. When his father, Jose Celestino, married his second wife, Pearl Spencer, Dave gained six additional half-siblings: Max George (1933-1994); Richard Ernest (1935-1993); Juanita (1937-1949); Rufino Eugene “Murph”); Louis Celestino; and Margie Ann. From Jose Celestino’s third marriage (to Lea Gladys Overson), Dave gained an additional half-brother: Robert. When David was two years old, the 1930 census was taken. I found David living in Alcalde, Rio Arriba County, New Mexico. 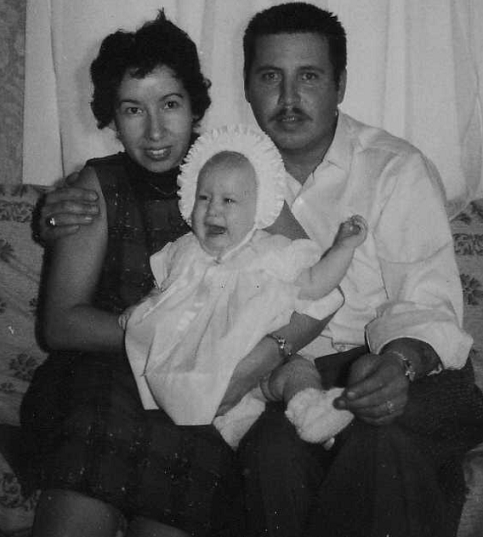 He was living with his father Celestino Montoya, age 24 and his mother Manuelita, age 24. Also in the home was his infant brother Pedro. Father Celestino owned his own home which was valued at $300. The residence was listed as a farm – and the family did not own a radio (that was one of the odd questions asked on the 1930 census). Father Celestino was performing “odd jobs.” The family is living next door to Manuelita’s father, Antonio Jose Lujan. Also nearby is Celestino’s sister, Ramona Montoya Gallegos. Sadly, David’s mother, Manuelita, died very young at the age of 27 on 13 Aug. 1931, and according to the 1940 census, David is living with his Montoya grandparents. He is indexed as being 12 years old born in 1928. He is attending elementary school and he is in the 6th grade. He lives in Velarde, Rio Arriba County, New Mexico with his grandfather, Maximiano Montoya, age 69 and grandmother Juanita, age 56. Also in the home is his younger brother, Pedro, age 10 who is attending school and is in the 1st grade. Grandfather Max indicates that he owns his own home which has a value of $150. Uncle Jose Ilario Montoya, age 24 lives next door with his family. Sometime after the death of his mother, David’s father Celestino left for Bingham Canyon to work the ore mines. This is where he met his second wife Pearl and where he can be found with her (along with four of their children) in the 1940 census. It is my understanding that David was very close to, and may have spent some time living with, Manuelita’s brother Tomas Lujan (1908-1995). 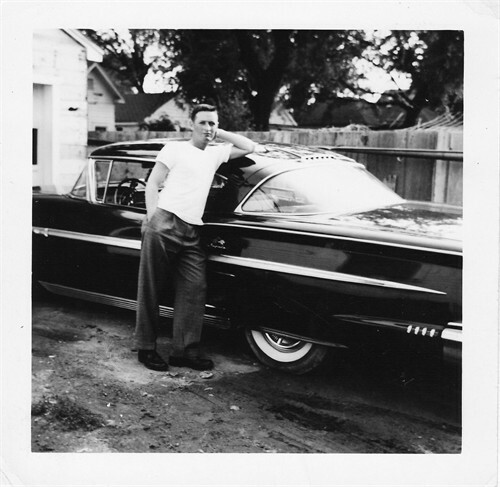 On July 13, 1945 in Salt Lake City, one day before his 17th birthday, David enlisted into the United States Navy. The record confirms many things that we already know about David – his date/location of birth; name of his father and grandfather; and it also confirms that his mother is deceased. 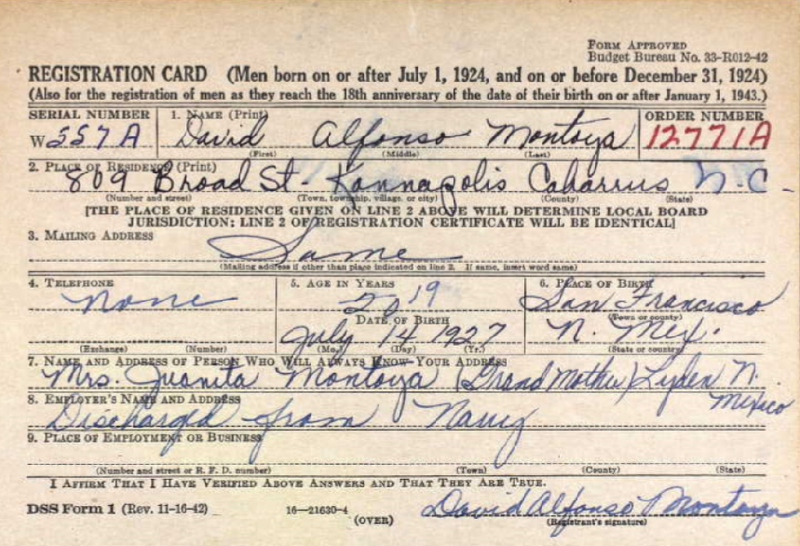 Further his World War II draft registration card indicates that he was living at 809 Broad Street in Kannapolis, Cabarrus, North Carolina at the time. He indicated that he was 19 years old and again confirms his date/location of birth. His grandmother Juanita Montoya was listed as his next of kin. 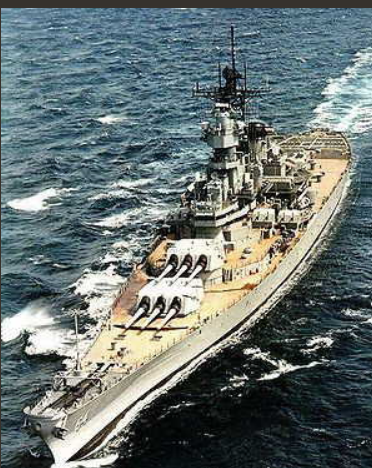 He appears on several Navy muster rolls as being assigned to the USS Wisconsin BB64 (Feb; Apr; and June of 1946). 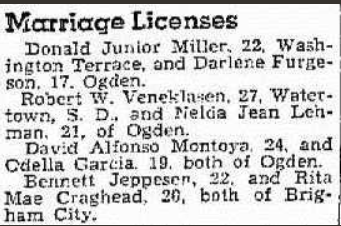 After his discharge from the Navy, it is assumed that he headed to Ogden, Utah where he met and married Maria Adela (Della) Guadalupe Garcia (1933-2009) on 9 Apr 1951. At some point after their marriage, Dave and Della moved to Salt Lake City where they raised a large family. Services/Mass for David will be held on Saturday, March 11th at St. Patrick’s Church in Salt Lake City. Neil O’Donnell & Sons of Salt Lake City will be handling the arrangements. Rest in peace, Dave, you will be missed. Over the last several years, I have reconnected with many of my Montoya uncles, aunts and many cousins. Most of them I barely know – some of them I have never met – most live in Utah and California. One of my younger cousins (everyone is younger than me these days), Syndi, set up a family group page for us on Facebook. 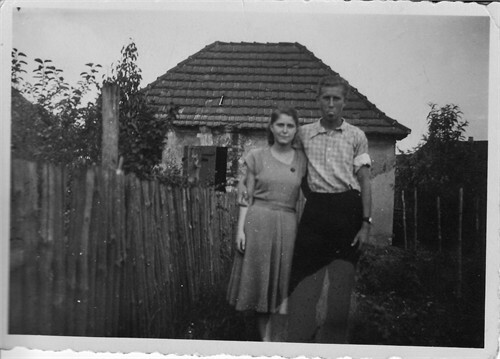 There we have shared our lives with each other – told family stories – and exchanged family pictures. We are all the children, grandchildren and great-grandchildren of Jose Celestino Montoya – and we share his common ancestry. In this family line there is a real interest in learning about our family heritage – I wish it were so easy with every family line! I am planning a trip to Utah next year where we are hoping to organize a family reunion. Really looking forward to that. This brings me to the point of this short little entry – you just never know when a brick wall will fall, when you find a new document or story, or when a new and spectacular photograph of your ancestors will surface. While cleaning and sorting through some things at her mother’s house, my cousin, Melissa, found this old photograph tucked away in the pocket of an old jacket. Thinking perhaps that the younger man was our grandfather, Joe C. Montoya, she posted it on the family page on Facebook for identification. I immediately recognized the woman as being Juana Martinez Montoya, my great-grandmother. 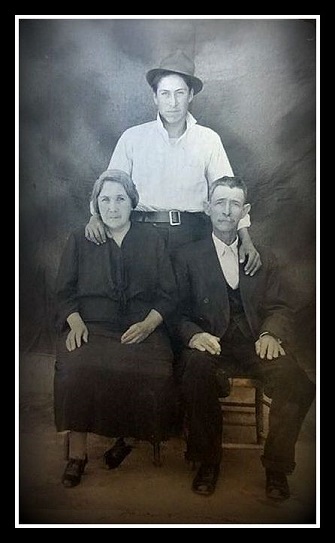 Sure enough – according to the writing on the back of the photo the people in the photo are: Juana Martinez Montoya and Maximiano de Herrera Montoya (my great-grandparents) and their youngest son, Raymundo Montoya. Raymundo died in 1939 at the age of 20 years – which dates the photo prior to 1939 (probably taken in Rio Arriba County, New Mexico). I love this photo so much because it is only the second photograph that I have seen of my great-grandparents. As my father aged, he looked just like Max does in this photo. (I inherited those great big giant ears too.) When I look at the face of my son – I see these men in him. After receiving the photograph – I walked around with a giddy grin on my face for days. A huge thank you to my family – and especially Melissa – for your willingness to share what you know and what you have. Together we are weaving our family story. I found my Dad and grandfather in the 1940 census! I’ve been trying off and on since yesterday; but the National Archives site was being hammered – and the site kept freezing up my computer. Tonight – success! There aren’t really that many surprises in this census. Joe and family are living in Bingham Canyon, Salt Lake County, Utah. All but two of Joe and Pear’s children were born in Bingham Canyon. Joe, in 1940, is an ore miner working for U.S. Mining Company. The family is renting their home for $15.00 a month. Joe states that for the previous year his yearly wages were $1,880. 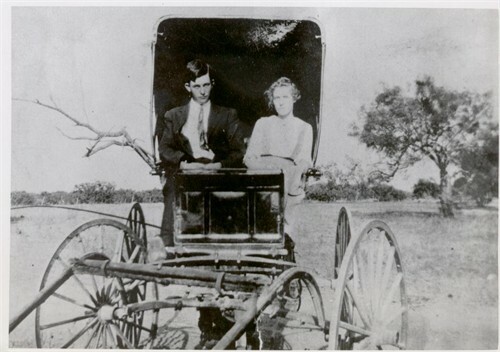 Joe and Pearl had been married for eight years. The children are Max, age 7 (who attended the 1st grade), Richard, age 5 (my dad), Juanita, age 3; and Eugene (Uncle Murph….that’s YOU !!!). What surprised me the most is that living with Joe and Pearl is Pearl’s father, George Francis Spencer who in 1940 is 70 years old. Onward to more 1940 discoveries !! As most of you know, when I delve into the life of an ancestor, I very often am not satisfied with only obtaining their statistics – I want to understand the time period and the circumstances that they lived in. In addition to learning about the various family branches, I have truly enjoyed receiving a lesson in American history – in fact – learning much more than I ever did in history class! As I scoot around town in my little Nissan – whether it’s heading off to work or to church or running a spur-of-the-moment errand – I, like most of us, take it for granted – not realizing the many difficulties and challenges our ancestors faced when traveling from place to place. My father, Richard Montoya - can anyone tell me the year, model and make?! In the 1800s, the most practical (and quickest) mode of transportation for our ancestors was via our country’s waterways. Because of this, many towns and settlements cropped up close to rivers, lakes and coast lines. By way of example, the family of Richard Spencer and Mary Earnshaw, my gg-grandparents, sailed from the Port of Liverpool, England on 7 Feb 1841 and arrived at the Port of New Orleans six weeks later on 31 Mar 1841. The family then made their way up the Mississippi River (presumably by riverboat) to the “Kanesville Branch” in Pottawattamie County, Iowa (present day Council Bluffs). A few roads did exist during that time period; however, they were clustered in and around settled areas and were time-consuming and difficult to travel. After Richard’s death, the widow Mary Earnshaw Spencer and her children began their journey across the prairie from the outfitting post at Kanesville, Iowa on 7 Jun 1852. Their journey lasted over three months. They arrived in the Salt Lake Valley on 27 Sept 1852. The company consisted of 293 individuals – 10 total families – and about 65 wagons. Many of these people walked, pulled hand carts, rode horses, etc., etc. 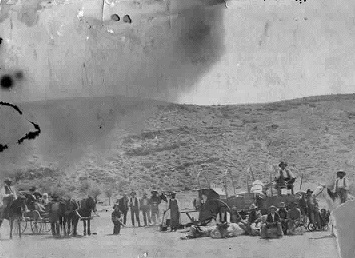 Those lucky enough had oxen which pulled their belongings in a covered wagon. It is no small wonder that many of our ancestors lived and died in the same region – some never leaving the county they were born in. I can speak for myself – I probably would not have lasted one day! The coming of the railroad changed the course of American history. Between 1830 and 1860 America experienced a massive railway building boom. The railroad began to transport food items, livestock and coal to outlying areas – something which would have previously been impossible to undertake. The railroad provided jobs to thousands and was a boon to many industries. People began to spread their wings and many settlements began to sprout up along the new rail routes. By 1869, rail workers completed the first coast-to-coast rail line. By about 1900, the average American was enjoying such things as fruits and vegetables from California and store-bought clothes from the Sears & Roebuck catalog – all thanks to the speed and efficiency of the railroad. And then at the turn of the century came the beloved American automobile. At first only the upper class could purchase this new contraption. By 1920, eight million Americans owned their own automobile. The burden of travel was slowly lifting; however, automobile travel remained difficult for some period of time as few good roads existed. In addition, it should be remembered that in the 1920s and even into the 1930s, horse-drawn wagons and cars shared the same road. 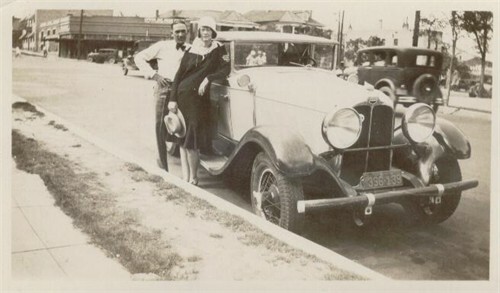 By the 1930s, more than half of America’s families own an automobile. This further fueled businesses such as repair shops, tire stores and gas stations. By the 1950s, nearly 50 million cars were on America’s roadways. And we do love our cars, don’t we?! In fact, it became part of the much spoken of “American Dream,” symbolizing our freedom and independence. Today, most American households have multiple vehicles. We have the freedom to shop and work practically anywhere we want. Our cities have grown large and sprawling. We started with riverboats and horses – and for most of us, the automobile is no longer a luxury, it is a necessity. And then there was the Saturday morning that my husband quit his job – and we promptly went to the car dealership and bought a new car AND a new pick-up. That’s just how us Curbows roll – I wonder what the ancestors would have thought about that?! My great great grandfather, Jose Ylario Montoya, remains in large part a mystery. In the two census records where we can reliably identify him, we are told that he was born in January 1844 and the next one states 1845 in the New Mexico Territory. The San Juan baptismal and marriage records are silent when it comes to Ylario, only his death date is recorded there. I have long speculated that perhaps he was the first Montoya of our line to settle in Rio Arriba County, New Mexico, perhaps arriving from another region of New Mexico. We cannot state with specificity who his parents are – but we have a potentially important lead in the 1850 census. My cousin Carma and I have both gone through the 1850 New Mexico Territory census, line-by-line and name-by-name. 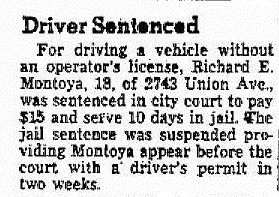 We found only one Jose Hilario Montoya – and we found him in Santa Ana County, New Mexico Territory. Santa Ana was one of the seven original partidos created in New Mexico under Mexican rule. Under American rule, it became a U.S. territorial county from 1852 until 1876, when it was absorbed by Bernalillo County. Santa Ana County does not exist today. The 1850 census was enumerated January of 1850 – The person that I believe to be my great great grandfather Jose Hilario Montoya is indexed as “Jose Ilaria Montoya, age 6 born 1844 in New Mexico. He is living with his grandfather Joaquim Montoya, age 81, a farmer who owns $1,400 worth of real estate; his father, Jose Ignacio Montoya, age 47, a farmer; his mother Anna, age 30. Also in the home are 4 siblings: Mercia, age 14; Justo, age 8; Rebecca, age 3; and Jose Bernardo, 10 months. Also in the home are six children with the last name of Baca. Their connection to the family is unknown at this time. It should be noted that later in life Justo Montoya can be found in Rio Arriba County and Jose Hilario named one of his daughters Rebecca. Could this be the family of my great great grandfather? If – and it’s still an if – I can prove that this is the right family (and I believe it is) then Hilario’s father, mother and grandfather are identified. Further, with the grandfather’s name, this line can be tied back to Bartolome de Montoya through his son Diego de Montoya, a Spanish Alferez. (An Alferez was the next highest ranking official after the Majordomo. He was generally in charge of the king or magnate’s private army, his knights and his armory.) But I am getting ahead of myself – back to what we do know! 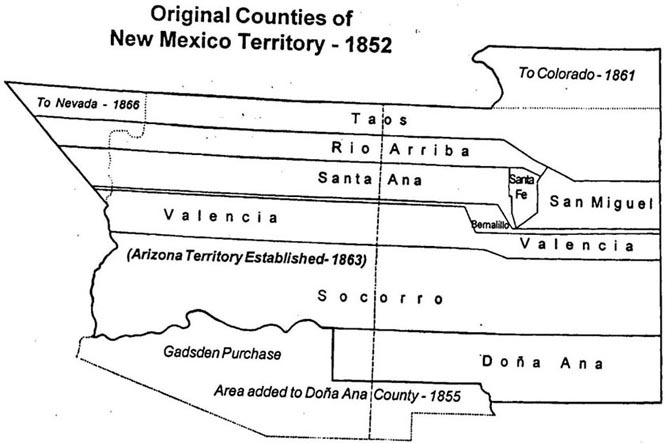 In June of 1860 the family is still present in Santa Ana County, in Pena Blanca. 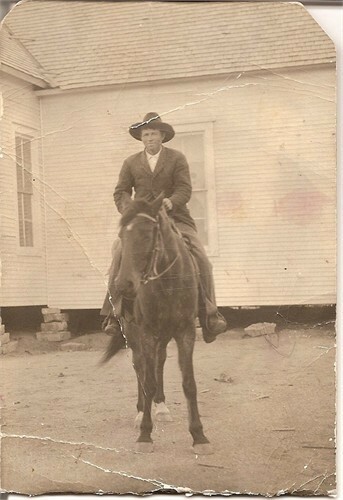 My Montoya grandfather (if this is him) is indexed as “Jose Lario,” age 20 born 1840. He is living with Jose Ignacio, age 90 (the grandfather – but the name is misindexed) who owns real estate worth $1,800 and personal property worth $10,800. Also in the home is his mother Anna Maria, age 40; and nine siblings. Jose Ignacio (the father) must have been skipped by the enumerator – or he has died. There are many Montoya and Gallegos families nearby. Based on later census records we know that our Jose Ylario Montoya had a wife named Josefa. In the Marriage Books of Santo Domingo and Pena Blanca, there is a marriage record that indicates that Jose Ylario Montoya was the legitimate son of Jose Ignacio Montoya and Ana Maria Gallegos, and that he married Josefa Montoya on 26 November 1863. In my mind the clues are adding up that this is more than likely my great great grandfather, Jose Ylario Montoya. The 1870 census was enumerated on the 5th day of July, and we see that the family has relocated to Trinidad, Las Animas County, Colorado Territory. My Ylario is indexed as “Jose Hilario,” age 33, he is a farmer who owns $200 worth of real estate and $178 worth of personal property, he states that he was born in New Mexico; he cannot read/write; We find him living with a daughter, age 6, Versele and a son, age 5, Ambrosio. There is no wife in the home. Ylario is living next door to mother Anna, age 54 who is a housekeeper. She owns $350 worth of real estate and $218 worth of personal property. Five of her children, and Ylario’s siblings, are still in the home. Interestingly, living on the other side of Ylario Montoya is the family of Polaris de Herrera. I do not know the connection; however, Ylario would later in life take a mistress, Augustina de Herrera, and have a large family with her, including my great grandfather Maximiano de Herrera Montoya. And here’s where it gets very confusing – the 1880 census finds Jose Ylario Montoya in Bosque, Rio Arriba County, New Mexico, where my grandfather and great-grandfather were born. He is indexed as “Ilario,” age 35 born 1845 in New Mexico. He is a laborer living with his wife Josefa, age 30. The children all belong to Augustina de Herrera, and she cannot be found in any census record – Jose, 16; Marina, 10; Maximiano, 8; Rebecca, 6; Albina 4; Anastario, 2; and Albina, 2 months. The 1900 census was enumerated in June of that year. Ylario is still in Rio Arriba County, New Mexico. He is indexed as “Ilario J.,” age 56 born Jan 1844; He states that he has been married for 36 years, which matches the marriage record out of Santa Ana County. Ylario is living with wife Josefa who is 50 born Mar 1850; She states that she has given birth 2 times and that both children are living. Living right next door is the mother of Ylario’s other children – who is indexed as Augustina Herrera who was born Oct 1850. She still has four children in the home. Augustina states that she is divorced and that she has given birth to 9 children – 7 are living. The family story is that Augustina de Herrera was the mistress of Jose Ylario Montoya – and that she lived right next door to Ylario and Josefa. Based on these census records, it is unknown to me who raised my great gandfather, Ylario or Augustina. According to the death/burial records of the San Juan de los Caballeros Catholic Church in Rio Arriba County, Jose Ylario Montoya died and was laid to rest in Velarde Cemetery on 7 Oct 1902. I have no information on what became of Josefa Montoya or Maria Augustina de Herrera. I was born on my father’s 25th birthday – and we always celebrated our day together – and things haven’t been the same since. Today he would have been 76 years old. It is Monday morning, July 18, 1949: When I opened my eyes this morning – I woke with a start of excitement! My name is Christa, and today is my 11th birthday! What surprises will the day hold for me I wonder?! It has been a little over four years now since my father’s tragic death at the end of World War II, and my family and I are slowly and painfully beginning to rebuild our lives. As I dressed and made my way to the kitchen, my two older brothers greet me enthusiastically with “Hertzliche Gluckwunche zum Geburtztag Kleine!” (Best wishes on your birthday little one). My mother – though we don’t have much – has a kleinichkeit (“just a little something”) waiting for me at the breakfast table. A banana – I have never had one! But there’s no time to linger long over breakfast – my mother and oldest brother are preparing to leave for work; my second brother has work in the garden and the rabbit hutch must be cleaned today; as for myself – there is always the housework. I wonder if perhaps I’ll have a spare moment to read a chapter out of my favorite book. I do so dearly love to read. Late this afternoon when we gather together again, I will look forward to having a slice of Erdbertorte (“Strawberry Torte”) which my mother has prepared from strawberries out of our garden. I wonder if it’s too much to hope that there might be some whipping cream to go with that torte? It is Monday morning, July 18, 1949: When I opened my eyes this morning – it was still completely dark and quiet outside, and I am very tired. My name is Richard, and I am 14 years old. 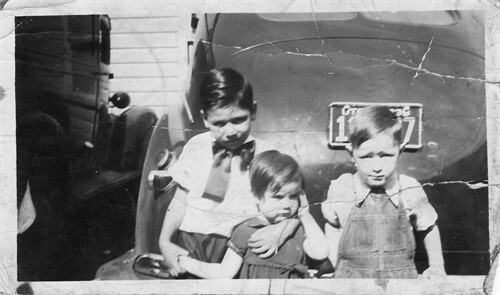 I can hear my mother in the kitchen as she prepares my father a thermos of coffee and urges my older brother and younger sister out of bed, It is 4:00 a.m. and we have to hurry – today we are driving to Willard to pick fruit – and we have to get on the road. The dew is all over everything and the air is heavy. I fleetingly contemplate sleeping another hour in the backseat of the car. We have barely made it to the edge of town – now wait a minute – are those truck headlights coming toward us? It invaded us violently and without warning – hot twisted metal, shattered glass and shattered lives – and then complete and utter silence. My head hurts so bad , and I can’t move my jaw – it just hangs limply as I try to call to my family. My mother – I can see her on the highway, but she‘s not moving. Max – Juanita – Where are you? Are you okay?! And then blessed darkness. My father did lose his mother and his sister on that day long ago. That one moment in time changed his life forever. The family sedan was struck head-on by a produce truck driven by a 19-year old who had been driving all night and had fallen asleep at the wheel. My grandmother died instantly. Juanita died some hours later from a head injury. My father suffered a head injury, a broken jaw and various internal injuries. His brother Max went through intensive rehabilitation for a broken leg and internal injuries; however, he did survive. 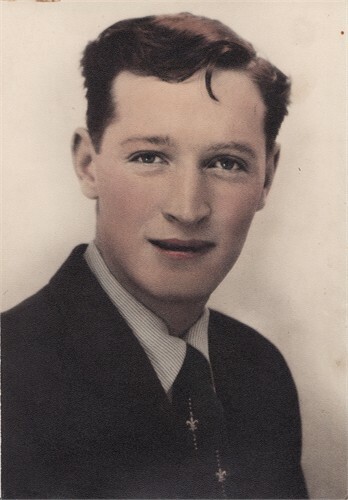 My father left home and joined the Army at the age of 17 and ended up stationed in Frankfurt. My mother went on to graduate from German high school and “tailoring” school. When she was 17 years old, she traveled to the “west” (Frankfurt) to visit an aunt and uncle. While in Frankfort, she met my father at a pub, and they were married shortly thereafter. Like I say ~ it’s destiny.